It is with great regret that the Club Office has received from Andrea Ham the sad news of the death of her husband David on Monday 7 March after a long illness. 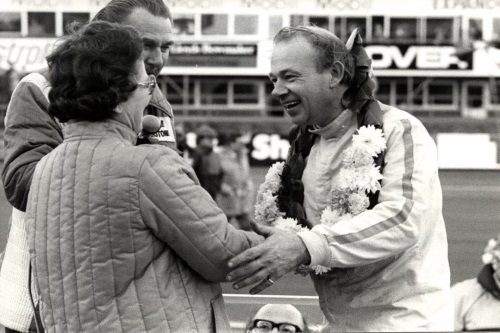 A Life Member, David Ham was originally elected as a Full Member of the BRDC in 1977 by which time he had been racing for some 17 years, his first race having been at a Midland Motoring Enthusiasts’ Club meeting at Silverstone in 1960 at the wheel of a 1936 Singer Le Mans Special. After an outing in a Turner-BMC, David raced first an Aston Martin DB3S before acquiring in 1963 the 1959 Le Mans-winning Aston Martin DBR1/300 with which he enjoyed limited success and unlimited mechanical maladies. As David would ruefully recall, the DBR1 was disposed of for very much less than its subsequent value. After some outings with DB4GT and DB5 Astons, in 1969 David acquired the unique Ecurie Ecosse-bodied ‘knobbly’ Lister-Jaguar BHL111 with which he became synonymous and which he campaigned not only in the JCB and Lloyds & Scottish Historic Championships and other historic races in the United Kingdom and Europe but also in various events in South Africa, Australia and New Zealand with considerable success. In 19 75 David was victorious at Phoenix Park and Snetterton while the following year he won races at Croix-en-Ternois, Le Mans, the Nurburgring, Zolder and Nivelles in Belgium. In 1978 he took six wins, three seconds, six fastest laps (including lap records at Zolder, Zandvoort and Montlhery) and five pole positions in the process of winning his class in the FIA Coupe d’Europe for Historic Cars. A solicitor by profession, David was a very proud BRDC Member who continued to race his immaculate Lister-Jaguar until he hung up his crash helmet only recently after which he and Andrea were regular visitors to the Clubhouse. To Andrea, his family and many friends, the BRDC extends its sincere condolences on the loss of a charming man. David’s funeral will be held at The Church of St. Edmund or St. James, Park Lane, Blunham, Beds, MK44 3NQ on Tuesday 22 March at 2.30pm. Family flowers only, donations to Sue Ryder Partnership for Excellence in Palliative Support, whose staff were so kind to David towards the end.